I just got back from my last weekend out in Northern California. After one more work week I will be leaving to go back home before my senior of college. I've greatly enjoyed my time out here and I'm going to be very sad to leave. For Matt and I's last weekend together, we decided to go to Napa again. Napa was my favorite place out here. I love wine country and I hope to be back here again throughout the rest of my life. My next few blogs will be about our great weekend in Napa, but unlike my last Napa blog, they will all feature a different place. Today's blog is about Gott's Roadside, a famous burger joint in St. Helena. We decided to head here after our first tasting. We got there around 1pm and there was a crazy line that was about 20 minutes long. This place is famous, but its definitely worth the wait. Matt and I split a mint chip milkshake and sweet potato fries and each got a burger. Even though it looks like a small place from the front, there is a whole lawn of covered picnic tables in the back too so we were able to sit in the shade. The milkshake was fantastic. It wasn't too creamy that you felt weighed down by it. Somehow it tasted very light. The burgers were no joke. There is a reason that this place was crazy busy and people are willing to wait. Their niman ranch burgers are made of 100% certified angus beef and are so tasty and juicy. It was a calorie splurge, but it was worth it. I also really liked the sweet potato fries. They were dusted with some chili spice and came with a tangy homemade ranch. It was a great compliment to the sweet shake. 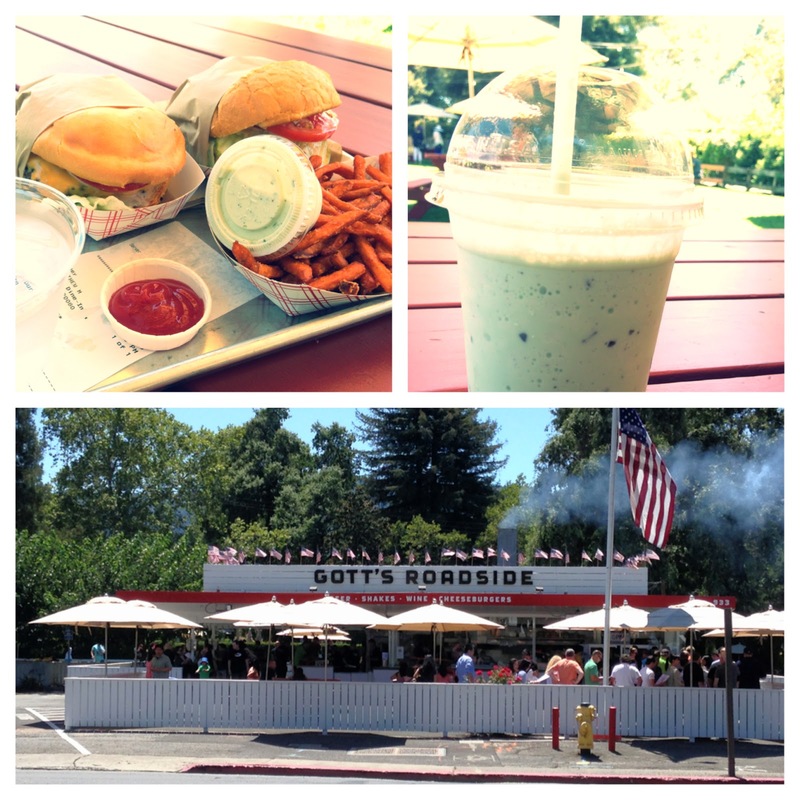 If you're heading to Napa, make sure to check out Gott's. The lines may seem ridiculous, but the food is definitely worth it.